Early in her training, Dr. Fleenor was drawn to the study of neurology. She completed her undergraduate degrees in biology and English at the University of Georgia and earned her medical degree from The Medical College of Georgia in 2011. Dr. Fleenor continued her medical training at The Medical College of Georgia where she completed an internship in internal medicine and a residency in neurology. It was during this residency that Dr. Fleenor developed a special interest in neuromuscular disorders while working at the ALS (amyotrophic laterals sclerosis) clinic. Dr. Fleenor completed her medical training with a fellowship in neurophysiology at The Medical College of Georgia in June, 2016. The following month, Dr. Fleenor chose to join Athens Neurological Associates where she benefits from working with the collaborative & dynamic group of physicians. 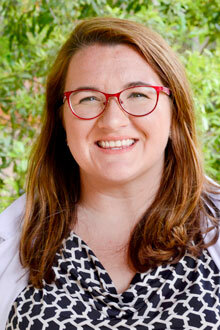 In her free time, Dr. Fleenor loves camping and hiking with her husband and two dogs. She also enjoys reading her favorite authors - Billy Collins and Gabriel García Márquez.